If you are concerned about your animal in any way this app is perfect to read up on anything you wish to know. So click on the link and get downloading! We now have two new products in stock! is bound to think it taste delicious too! 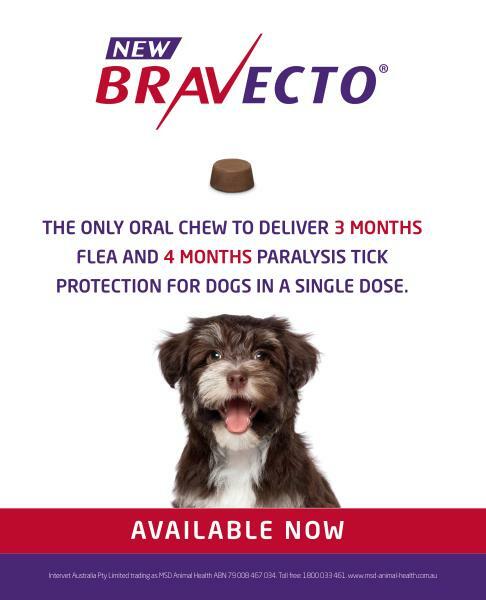 We also have another new product under the name of "Bravecto" it is a 3 monthly chewable for Fleas and 4 monthly chewable for Ticks. You can start your dogs or puppies on this from 8 weeks of age. UPDATE: We are always in tick season . Paralysis tick is a major concern at Batemans Bay. Please ensure that your pet is covered. There are many options (for example, spot-on's, tick collars, tablets, chewable etc..) and some may suit some patients more than others (i.e. 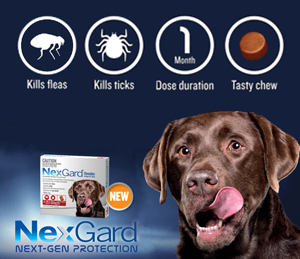 if your dog swims, then a tick collar would not be ideal). 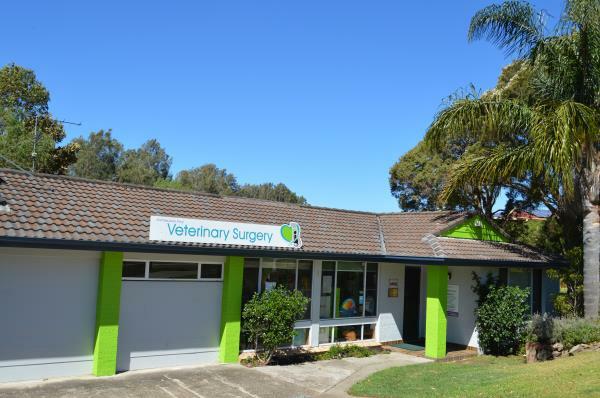 Batemans Bay Veterinary Clinic is owned and operated by Dr Paula Roberts. Dr Paula Roberts has been a veterinarian for over 30 years and has lived and worked in Batemans Bay for at least 15 years. We have our own surgery cat called "Bella" if you have not met her she certainly will tell you she runs the place. We cater for the treatment of "special friends" including cats, dogs, rabbits, ferrets, mice, birds and poultry. With fully equipped examination rooms, diagnostic machines and pharmaceutical stores we provide on-the-spot assistance for nearly all pet health needs. We have an in-house pathology laboratory, radiology, ultrasound and dentistry, and perform small animal medicine and surgery, so you won't have to go anywhere else. Feel free to take a clinic tour. We also run Puppy Preschool Classes on a regular basis - this is an early education and socialisation programme for puppies and their owners, teaching basic commands and health care in a fun and safe environment. We also take part in the Delta Dog Safe Programme which is presented to Primary School age children to teach them awareness in regards to dog safety. We also offer professional advice on animal behaviour and related medications. 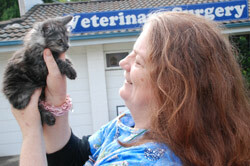 Batemans Bay Veterinary Clinic Cat Adoption Centre caters for kittens that require re-homing. We have rehomed over 250 kittens in the last 2 years, so if you're looking to add a purrring feline to your family, visit our cat adoption centre. The purchase price of one of our gorgeous kittens includes 1st vaccination, microchipping and pre-paid desexing, as well as a sample of kitten food and advice on caring and loving your new found friend. So take a moment to meet our team. Dr. Paula Roberts and the rest of the Batemans Bay Veterinary Clinic look forward to making you and your pet feel right at home, whenever you come to visit us. 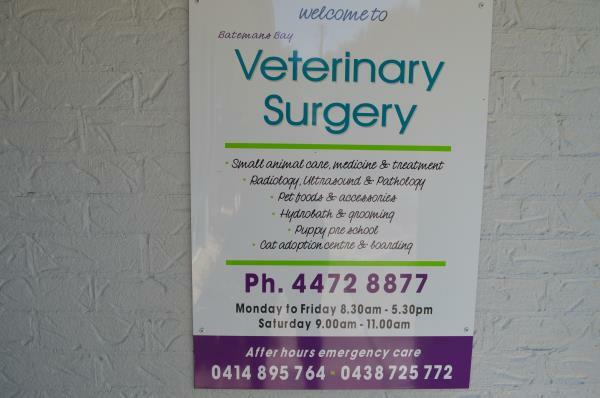 Batemans Bay Vet Clinic is open 6 days a week, plus our after hours service provides you 24/7 assistance in emergencies.